oh no I am so sad for you hang in there and God Bless Paws! I am so sad for your loss. I know that my dog is a most special person to me. My life would change with out her. Kim, I am so sorry to hear of your loss. What a special picture. 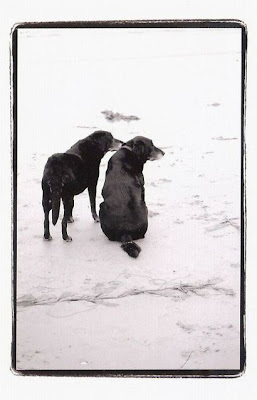 Such a precious photo of your two sweeties enjoying the day together ~ I am so sorry to hear of Paws' passing! I know exactly what you mean when you say "the gifts and loss are unmeasurable". We lost our lab Bentley 2 years ago at 11 1/2 and this past December adopted a sweet lab Ernest who turned 12 last month. In my thoughts ...Deb. So sorry to hear your news. We understand your grief having lost our Katie a few years ago. They become a part of our families don't they? I know what an awesome doggie mom you are and how much you loved Paws. I'm soooo sorry. It's a huge loss. She had the best home imaginable with you. Blessings to you during this difficult time. That is such a gorgeous photo of the two of them- may you look back at it often to remember the joy they brought to you. My heart is breaking for you! Our sweet dogs are in deed "always faithful" I un-officially follow your blog, so I'm familiar with your story and the life of your dogs...each one a special member of your family! My prayers are with you!